The 29.87 metre motor yacht Asmaa has been listed for sale by Kirill Anissimov at Fraser. 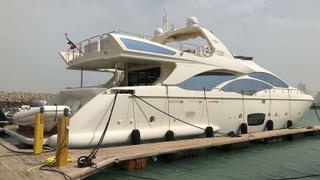 Built in GRP by Italian yard Azimut to a design by Stefano Righini, Asmaa was delivered in 2012 as an AZ 95 model. Accommodation is for eight guests in four cabins consisting of a full beam master suite, VIP suite and two twins. All cabins have entertainment centres, Sharp television screens and en suite bathroom facilities while a further two twin cabins sleep four crewmembers aboard this yacht for sale. The main saloon has comfortable settees and armchairs upholstered in leather, a fridge and icemaker and an entertainment centre including a 52-inch Samsung television screen mounted on a rise and fall mechanism, and a Denon stereo surround sound system. Forward is a dining area with seating for up to eight guests and storage for glassware, china and silver. The aft deck offers U-shaped seating, a teak table and full wet bar, making it the perfect location for al fresco cocktails before going in for dinner, while the large flybridge features a wet bar, seating for up to ten guests at the main table, a barbecue grill and a Bimini top. Twin 1,925hp Caterpillar diesel engines allow a cruising speed of 22 knots, topping out at 24 knots. Lying in Kuwait, Asmaa is asking €3,200,000.